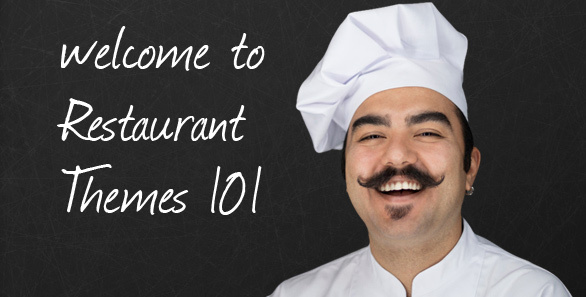 home » blog » announcement » welcome to Restaurant Themes 101! We have all seen tons of blog posts that go something like this: “The best 15 restaurant themes for WordPress”. In these blogs, the author usually puts up screenshot images of 15 different themes, and adds 3 lines of a (useless) text. Why is this text useless? Because it tells you even less than you can see on those screenshots. After reading such a post, you need to do some more serious research on the themes the author mentioned, and let’s face it, if you want some help with finding the right theme, this kind of “help” isn’t really helpful. Of course, the first thing that comes to mind, when we eliminate the previously mentioned blog posts, is the several theme search engines/collections that are available online. Some of them feature quality content, some of them don’t, some of them feature a ridiculously low number of actual restaurant niche themes, but most importantly, they all lack a good filtering system. If you’ve decided to buy a restaurant theme, you want to choose your theme by important and relevant criteria, such as OpenTable integration, the possibility to order online or if the theme features a menu card, and many more. Most search engines only give you the possibility of filtering the themes by only few criteria, like colors used for creating the theme. This just won’t cut it, a professional knows what he wants and needs out of a theme, right? Dear restaurant owners, this is where Restaurant Themes 101 steps in, as a result on many months of careful development and content creation. Here at Restaurant Themes 101, we are using a custom built WordPress theme for our website, with a very sophisticated and detailed filtering system integrated. You will be able to filter the themes and templates by many important criteria, and easily find the theme that contains exactly what you are looking for. A full list of all features can be found on the help page or of course the filter itself, which you can see in action on the homepage. For starters, let’s just mention some of the criteria you can filter the themes by: sort the inventory by user rating, theme release date, the name or its price. You can filter the themes by software type (eg. WordPress, Joomla etc. ), license (GPL/non-GPL), restaurant type (eg. fast-food, Italian, Japanese etc. ), theme developer (eg. Colorlabs, Themefuse etc. ), theme features (eg. Bootstrap powered, Foursquare integration, OpenTable integration, opening hours etc. ), theme colors (eg. black, blue, pick your own color etc. 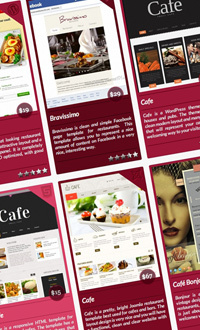 ), theme styles (eg. artistic, minimalist etc.) 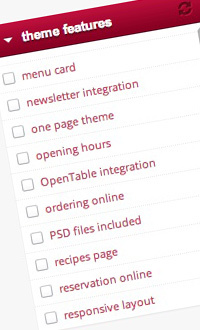 and theme navigation (footer, side or top menu). Once you sort out the kind of theme you are looking for, you will get a well-written description of the theme, with screenshots of each important feature added and displayed in a well-organized screen. Everything is carefully packed up and served to you; all you need to do is pick the right one! Now, did we work on details or what? I’m not here to lie to you, you really will be able to filter the inventory based on tiniest details, and easily find exactly what you are looking for. Don’t believe me? Hit the “home” button and check it out for yourself!